Two days ago I mentioned taking my Manta road bike in for a complete overhaul, and today I got the call that the Manta was ready. Tomorrow morning I'm taking the Manta for a long test ride — I can't wait! Looks hot Mike. Makes me wanna get out there and get some riding in. Enjoy and I hope to talk to soon. Very nice. Makes me want to get something similar, although I've been looking at going the mountain bike route -- not sure if I can fit on a speed/road bike, heh. Looks great Mike! I just had my bike overhauled too and took it on a trip through the Black Hills in South Dakota. 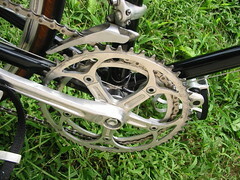 Getting your bike overhauled really renews interest in riding again. Have fun! What a treat to see these pic's. 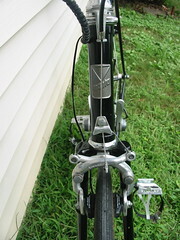 I had forgotten all about Universal center-pulls and shifters on the down tube. This bike took me down memory lane. Very nice Mike. Hold on to her, she's a classic. Travis � I suspect there are tons of great old MTB bikes out there now, as long as you aren't interested in a shock front fork. My old Diamond Back MTB is like that and it's great. Tim � I didn't know you had a road bike, or is it an MTB? That trip sounds like a blast! We need to get together and ride before the snow flies this year my man. Looks great Mike. I see yours has the centerpull brakes and the logo plate on the head is one color.Mine has the quick release side pulls and there is red in the logo.What kind of tires do you have on it? 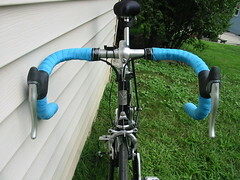 Dale, yep the centerpulls came with the bike and since they worked I decided to hang onto them. The logo on mind was red, black and silver, but I painted it petwe to match my color scheme back in 1993. I have Contiental gumwalls on the bike, not sure of the exact model or number but they are excellent tires. I do remember the longer stem. I may want to check into that. Thanks for the photo! How do you like that leather saddle? I've often thought about one. Mike, before turning to design, I owned a couple of bike shops that sold high end mountain and road bikes. So I appreciate your Manta as both an old school bike fanatic and a designer. My advice, if you haven't been out on the road for a while, you might want to consider a stem with some rise. Just a thought from one battered chair monkey to another. Peter! Wow, another design and biking guy. Somehow those two passions seem to merge quite often! As to the seat and handlebar height � the shop goofed on the seat height when they put it back in, so that it was nearly un-rideable. I snapped the shots before I've adjusted the seat down. Dale: Great info. A buddy has a Brooks leather and loves it. My saddle is a Brooks but more modern design and I've always wanted to get a Brooks leather. Maybe now is the time!! Anyone have experience with the Selle Italia An Atomica saddle? It's similar to the Brooks in leather but a more anatomical design, and supposedly very comfortable without the break-in time needed on a Brooks saddle. Any feedback is helpful. The bike is looking in shape Mike :). Got how many gears in it? No luck on the leather saddles over here. Another thing I was thinking of adding was a carbon seat post or shock absorber type post. I have looked at trying to do things with keeping the costs to a minimum to get the smoothest affordable ride. I have looked into carbon forks for 27 inches- none available in my extensive searches. ( I am not done yet though. 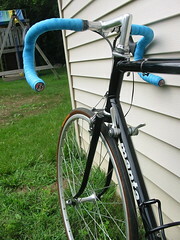 )Carbon handle bars my help but could be cost prohibitive. These features would put you in the technology of the Trek 520 touring bikes. I am always looking for good used items to do the upgrades but I also want to be true to the Manta." The road is your friend - Live the road and you will live. " 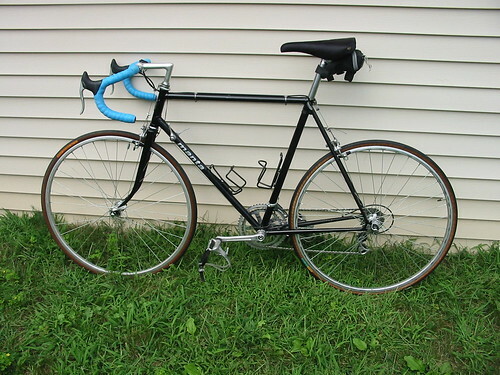 I purchased an old black Manta roadbike off of Craigslist last year. I have pretty much fixed and or replaced everything, and I have to say, this is a dream bike to ride.